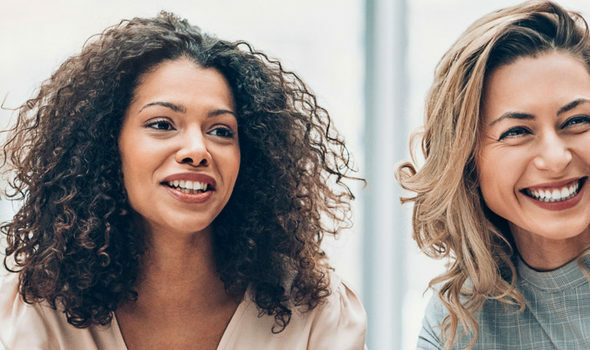 Sodexo Benefits and Rewards Services recently conducted a survey of 4,805 SME leaders in 7 countries, and found that investing in initiatives to improve the Quality of Life at work is not only beneficial to employees’ well-being – it is also good for business! 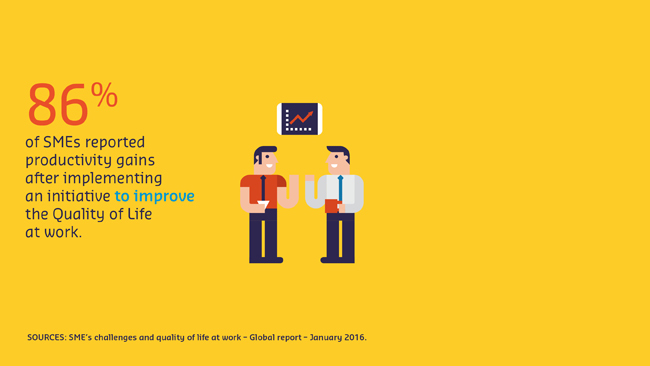 86% of SMEs reported productivity gains after implementing an initiative to improve the Quality of Life at work. 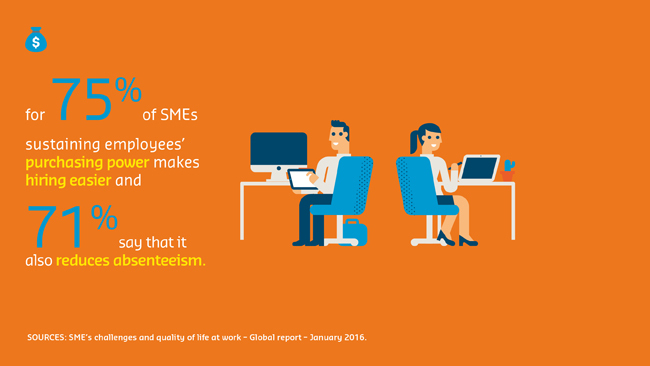 SMEs do not have access to the same resources as large corporations, but they still have a wide range of Quality of Life initiatives at their disposal. 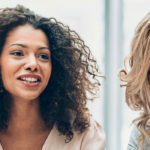 Savings plans, health coverage, fitness programs and rewards are among the most common – and popular – initiatives for SME employees. And the benefits are passed on to the business! 71% of the SMEs surveyed believe that rewarding individual performance boosts sales. Recognizing people for their effort makes a real financial impact. This is particularly true in India, where 97% of business leaders notice an increase in sales when they reward employees for their work. 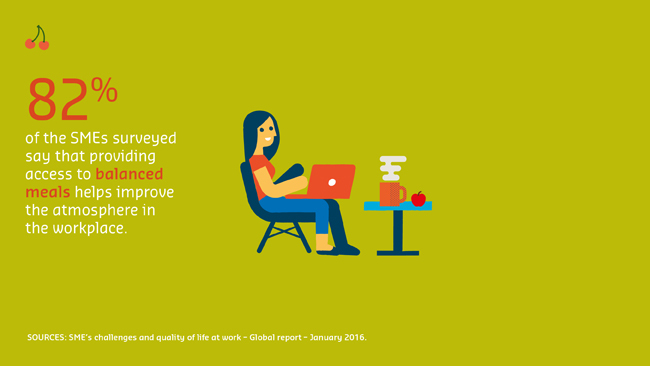 Improving employees’ work-life balance results in productivity gains for 89% of SMEs and increases sales for 74%. Programs that enable employees to strike a better balance between work and their personal life – concierge service, daycare, etc. – are very popular with workers. 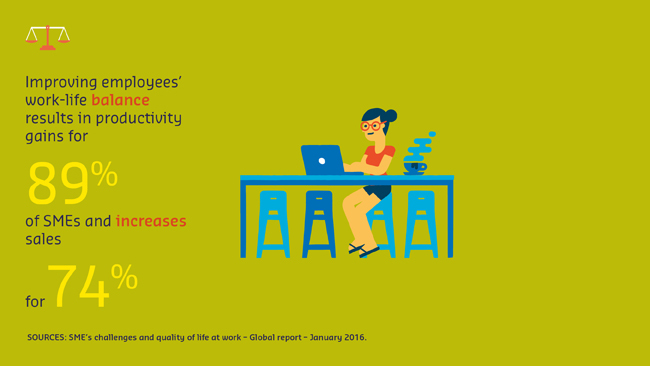 And for SMEs, this extra time and peace of mind has a positive effect on productivity (89% of survey respondents), the atmosphere in the workplace (93%) and even sales (74%)! For 75% of SMEs, sustaining employees’ purchasing power makes hiring easier and 71% say that it also reduces absenteeism. 58% of SMEs believe that attracting new talent and hiring skilled employees is one of their key challenges. 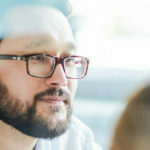 Quality of Life at work is one of the major appeals of working at an SME, versus the benefits and career opportunities offered at large corporations. Sustaining employees’ purchasing power by providing them with access to health coverage or an employee savings plan is a very effective means of increasing this appeal. Both types of initiatives will be major investment priorities for SMEs over the next two years, when initiatives to sustain purchasing power are expected to rise 17% worldwide. 82% of the SMEs surveyed say that providing access to balanced meals helps improve the atmosphere in the workplace. Is the way to happy employees through their stomachs? The survey supports the idea: 82% of SMEs that help their employees eat healthier meals – in particular by offering meal passes and cards – notice an improvement in the atmosphere at the office. The effect is even more pronounced in Turkey (92%) and Mexico (94%)!